Microsoft Excel dashboards as a business tool are a presentation powerhouse, and they are the Excel tool that Microsoft Excel data scientists, Excel visualization experts and Excel developers use to present KPI reports and analysis on your organization’s data, BIG, small or HUGE. For this post we will look at Microsoft Excel dashboards in two phases, phase 1 is on ‘small data’, in Excel 2003 or earlier, phase 2 is on ‘BIG data’, in Microsoft Excel 2007 and later, based on the number of rows and columns available in the Excel workbook for the user to place data and formulas. Dashboards in phase 2 then take a dramatic turn in Excel 2010 as you now have a second and more powerful way of creating Excel dashboards by using Microsoft Excel Power BI to create ‘Power BI Dashboards’. Microsoft Excel Dashboard reports, also called Excel scorecards or Excel executive summaries are more often than not made up of the primary key performance metrics (KPI‘s) that upper management use to make critical business decisions to run their day-to-day operations. (The image below is of a Microsoft Excel dashboard). It was just a few years back when the phrase ‘Excel dashboards’ was the hot buzzword that had corporate key decisions makers totally excited, and many of them were looking for their own powerful, fully automated and integrated Microsoft Excel dashboard solutions. 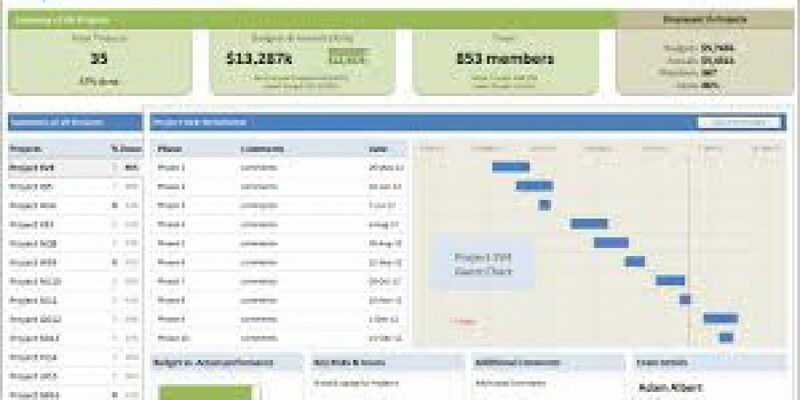 It was during that time that many of our clients started to hire us to make powerful Excel dashboards for their organizations. Just take PepsiCo or RubberCraft for example, we have built several fully automated and integrated dashboard solutions for their organizations out of our office in Irvine California. Our work building custom Excel dashboards for our clients has not slowed since the phrase ‘Microsoft Excel Dashboards’ first became the hot topic. If your organization needs a dashboard solution or if you would just like to know more about them, give us a call or send us an email. We are here to help. A little history regarding the versions of Microsoft Excel that have the capacity for ‘BIG data’, versus those that are restricted to ‘small data’. It was with the release of Microsoft Excel 2007 that the user could first have up to 1,048,576 rows of data. That is up from 65,536 rows of data in Microsoft Excel 2003. This is the moment when Microsoft Excel went from a small data application to a BIG data application. This exponential increase in the number of rows that one could use in their Microsoft Excel applications unknowingly and rather quietly released the Microsoft Excel ‘BIG Data Jeannie’ from the bottle. It was great that MS Excel could now house so many more records than it could in the past, in theory at least, but there was one rather large problem with the use of BIG Data in Microsoft Excel 2007; try running an Excel workbook with ten tabs, each tab having 30 columns, and 500,000 rows filled with VLookups, SumIfs, Index/Match, or arrays, etc. Even on a state of the art office desktop computer, the workbook will not perform at acceptable standards. Microsoft Excel 2007 just does not have the power to properly deal with BIG data. This problem would not be overcome until Microsoft released Microsoft Excel Power Pivot in Microsoft Excel 2010. Microsoft Power Pivot and Power BI was/is a game changer, it allows data scientists and Excel developers to build the most dynamic amd the most powerful Excel dashboards – Power BI dashboards. 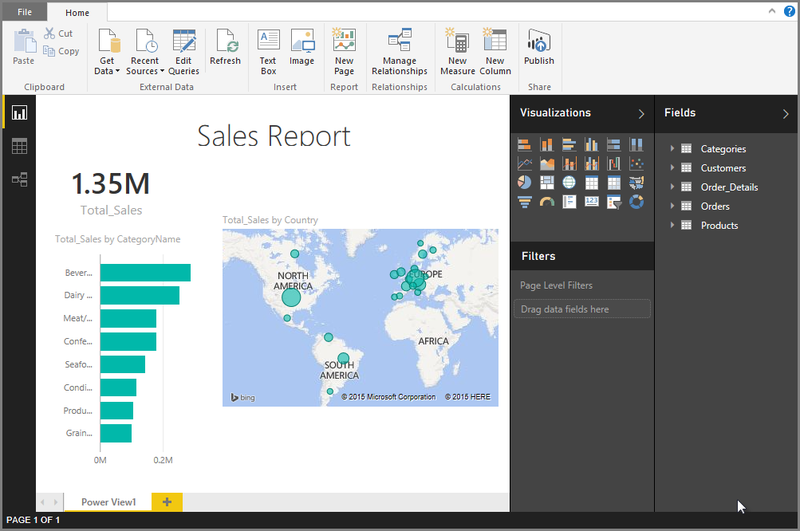 Microsoft Power BI Dashboards, reports, and datasets are at the heart of Power BI service. Use Microsoft Power BI to create personalized dashboards to monitor your most important data, at a glance. 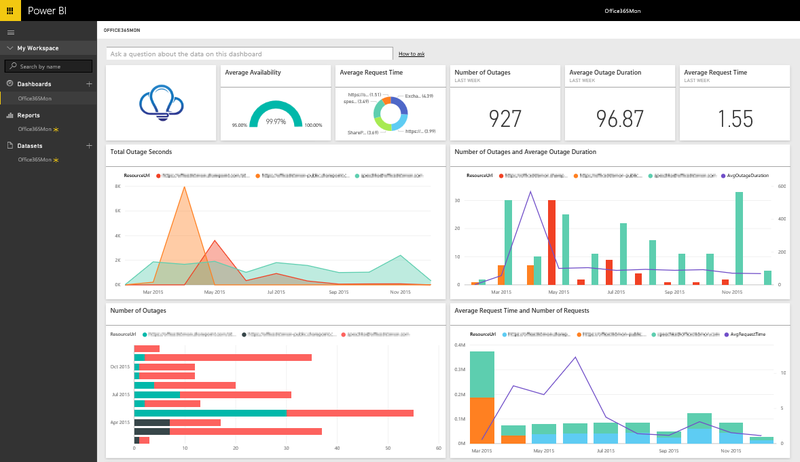 A Power BI dashboard combines on-premises and cloud-born data in a single pane of glass, providing a consolidated view across the organization regardless of where the data lives. Each metric, or insight, is displayed on the dashboard as a tile. 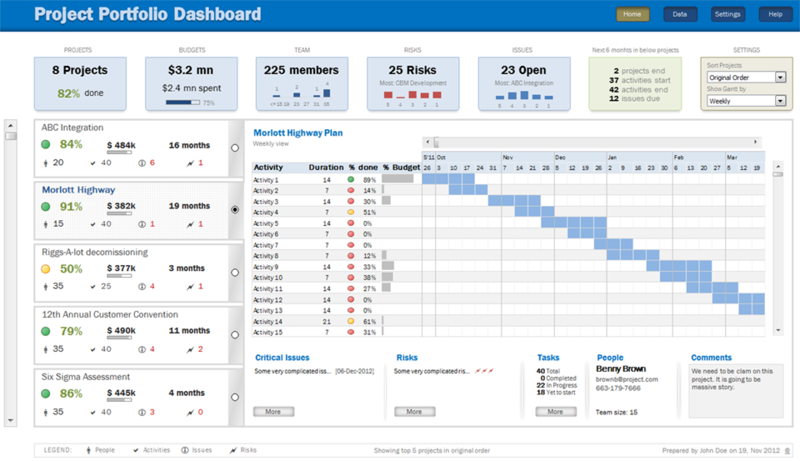 A dashboard that contains one or more pages displaying a variety of reusable reports and information to be used across a large group or the entire organization. The dashboard can contain robust scorecards and reports, as well as display reports that are hosted on other servers. 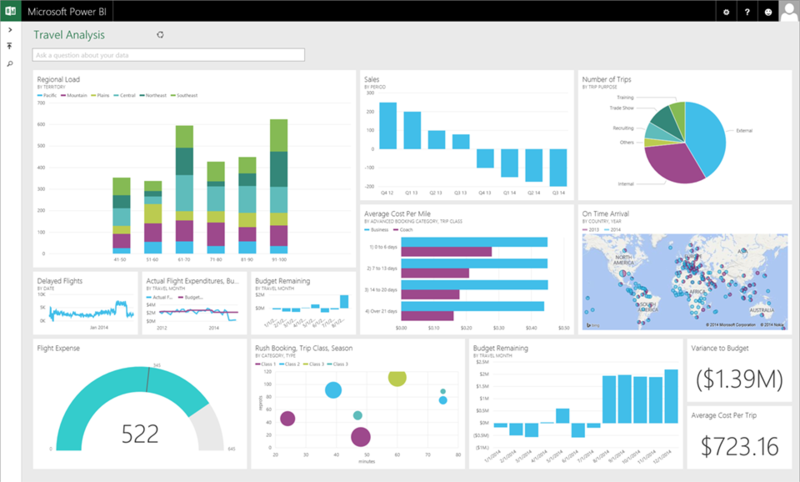 Learn how to create a new dashboard, visit this page on the Microsoft Power BI website. What is Microsoft Excel Power Pivot (What is Microsoft Power BI): Power Pivot is a feature of Microsoft Excel, available as an add-in in Excel 2010 and 2013, and is included natively in Excel 2016. Microsoft PowerPivot extends a local instance of Microsoft Analysis Services Tabular that is embedded directly into an Excel Workbook. This allows a user to build a ROLAP model in PowerPivot, and use pivot tables to explore the model once it is built. This allows Excel to act as a Self-Service BI platform, implementing professional expression languages to query the model and calculate advanced measures, says Wikipedia. A true game changer in Microsoft Excel’s ability to deal with BIG data as well as in the world of Power BI. With the advancement in what Microsoft Excel can do with large data sets in Excel 2010 and later, and with the advanced data manipulation and data analysis techniques used by Excel’s data scientists and data visualization experts there was finally a way to quickly make visual and numerical sense of the super large data sets possible in Excel 2010 and on, appropriately called ‘BIG Data’. The tool that changed the speed and power of Microsoft Excel dashboards was Microsoft Excel Power BI and Power BI dashboards. Power BI dashboards allowed data scientists to tame the BIG data beast. As Excel Consultants we want to help our clients make the most of their data with customized Microsoft solutions. One of our most popular and useful offerings is dashboard development, including the option of using the more advanced Microsoft Excel Power BI dashboards. After all, the convoluted columns of information in your spreadsheet won’t do your company any good if you can’t comprehend them. We can make your Excel dashboard an intuitive interface through which you can access, manipulate, and interpret the cells of your Excel spreadsheet. For twenty-first century companies, having a clear, computerized approach to your company’s statistics is standard, especially with the increasing need for business intelligence software such as Power BI. More and more clients are turning to dashboards to fill this role. You’ll use this tool on a daily basis, so it’s important that your dashboard be functional, attractive, and effective. We understand how to make your life easier and your work more efficient with successful dashboard design. To learn more about this software solution or schedule a consultation, contact Excel Consultant today. Dashboards are similar to poems: you cannot firmly establish their structure or content. Each interface is a unique reflection of the user or company’s specific needs and wishes. Excel’s multifaceted flexibility becomes a blank canvas for dashboard creation. Even still, there are some generally accepted standards for this type of design. While the precise functions of and organization for each dashboard are distinctive, the programming processes that drive these features are strict and systematized. In addition, a successful dashboard must be both practical and aesthetic—complex coding underlies the user-friendly simplicity of the design. In this way, dashboard creation is both an art and a science. There are numerous books, guides, and tutorials on this nuanced subject. Many Excel users and business owners struggle to create dashboards that serve their purposes without becoming too complicated, unattractive, or difficult to use. Since this interface will become a vital part of your everyday operations, working with an expert is worthwhile. Excel Consultant’s team of Microsoft masters has the creativity, knowledge, and technical expertise to develop outstanding dashboards. We use VBA (Visual Basic for Application, a programming language) to create dynamic, robust, powerful dashboards that run well and look great. Our Irvine office handles a steady inflow of dashboard requests. Our programmers can help you tap into the often-overlooked power of Excel and generate visually stunning representations of your data. Our beautiful, personalized portals and reports give PowerPoint presentations a run for their money in terms of aesthetics. Providing both advanced operations and an appealing appearance at once can be challenging, and certainly isn’t something everyone can do, but our team knows how to tackle this task. We build awe-inspiring dashboards people love using. Data tables. These format and arrange information in an accessible, easy to read way to provide a quick snapshot of your data. In designing dashboard data tables, filtering out unnecessary information and highlighting the important values is key. We can do so with both flat tables and more interactive pivot tables. Charts. Like data tables, charts break down your information into digestible, visual segments you can scan and analyze. With the latest Excel technology, you can even make these charts dynamic, meaning that they can move and update as the user views them. Graphs. These plot your information so you can track trends, sway investors, hit your production goals, and more. Text. Excel isn’t all about numbers. Words can help explain the various data tables, guide users, and communicate further details about the information on your spreadsheet. Drawing shapes. This Excel function adds to the visual aspect of your dashboard while providing a different way to present information. Automation options. Manually moving files, cells, charts, and tables can be a tedious drain on your team’s time. We strive to automate as many dashboard operations as possible so you can focus on more important undertakings. You can certainly view and manipulate your Excel dashboard on the screen, but many companies also use these tools to create printed reports. These can be distributed amongst employees, shown to stakeholders, or even utilized in marketing campaigns. Typically, a dashboard report is a single-page, refined version of the information presented on your digital interface. We can help you create workable templates and customize these documents for particular clients, departments, timeframes, and more. Being able to author compelling reports could make a big difference in your ability to collaborate with partners, share data, advertise, and succeed as a business. Are You Ready to Upgrade Your Dashboard? Dashboard design can help you harness the power of Excel for your business. Contact Excel Consultant today to learn more about our customized software solutions or schedule an appointment with a member of our team. Are You Ready to Upgrade Your Dashboards in Excel 2019? Microsoft Excel/Office 2019 is on the way, and the big question is this, will there be changes that have a positive impact on Excel dashboards, and Power BI Dashboards as well.